Although my primary interest is the comics themselves and their makers, I will admit to occasional bouts of fascination withi the industry of covering comics. One of those avenues for exploring the medium today is a bunch of published material driving attention to modern and nostalgic expressions of mainstream comics. I was happy to receive in the mail a book from TwoMorrows (currently on sale) featuring a full-length interview with the talented artist Cliff Chiang. I've enjoyed Chiang's art in a variety of titles, most recently the New 52-era relaunch of DC 's Wonder Woman. I know relatively very little about him. I was also intrigued that this was the the twenty-ninth book in the series. TOM SPURGEON: Chris, I know that you've written for most if not all of the major pop culture oriented comics sites, but I'm not sure I know where writing about comics lies in the overall spectrum of what it is you do? How much of your professional life is the work you do about comics? CHRIS ARRANT: Currently the majority of my time is spent writing about comics freelance for Newsarama, CBR, and various other outlets and companies. I've been doing it professionally since 2003, but up until 2011 it was merely a side job to my main focus as a freelance graphic designer and marketing consultant. That work is for local clients in Northwest Florida and is far removed from the comics industry, but it's what I was trained in and what I did prior to going freelance full-time in 2005. 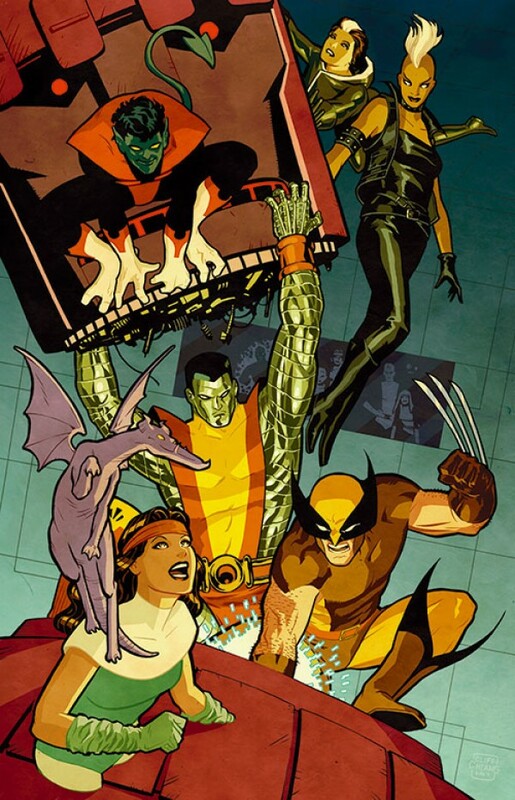 As of this interview, my main outlets for journalism is covering the Marvel beat -- with some occasional forays elsewhere -- for Newsarama, along with doing some work for CBR's Robot 6 blog including a Friday Q&A series titled Conversing On Comics. 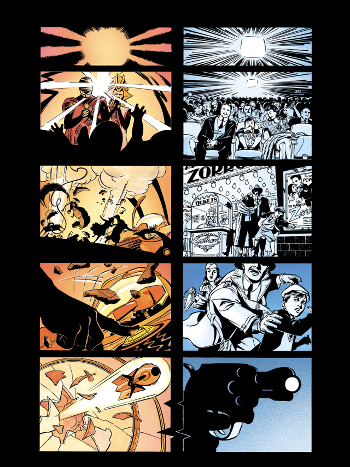 TwoMorrows recently released the long-form interview book I wrote, Modern Masters: Cliff Chiang, and I've got some work put into two other long-form comics journalism books, but those are still in the early stages. I occasionally pick up additional assignments for print magazines or other websites, but Newsarama and Robot 6 is where people can find me on a regular basis. And, as like most any self-respecting freelancer, I'm always looking for opportunities to do more. SPURGEON: You're also an occasional writer of comics; is that still an ambition for you? I know you have a Badrock comic coming out this year, but would you do more work if you could? What do you think has kept you from doing more work? ARRANT: I'd definitely be interested. I've always considered myself a writer; first as a fiction writer, then comics writer, then journalist -- but all writing. I found journalism in high school and that inadvertently led me back to comics in 2003 to cover it. I did self-published work in the early 1990s out of a now-defunct Prodigy forum, and like you said I've done some in the past for anthologies, webcomics, and even a biographical comic for Bluewater. I have ambitions to do more comics writing, both creator-owned and work-for-hire -- I have a couple projects in the works -- but for the past few years I've primarily focused on comics journalism and my graphic design work. A number of notable comics creators came to comics from a journalism background -- a number from comics journalism, even: Mark Waid, Chris Staros and Paul Levitz come to mind, and Axel Alonso and Ron Marz come were journalists outside comics before they came in. That being said, I'm extremely conscious about the potential conflict of interest that lies there, and I'm careful to avoid it; when I was doing work for those Image anthologies and in the immediate aftermath, I turned down assignments covering Image projects. Since I committed to doing work with Rob Liefeld, I've discussed it with all my journalism editors that I wouldn't be able to cover his work as to avoid any perceived conflict of interest. The script for that Rob Liefeld project has been turned in for almost a year now, but until it's out I find it in my best interest -- and the people who read my journalism work -- to avoid covering it. SPURGEON: Do you think the professional experience you do have provides you a perspective in talking with comics professionals that is useful to you? What do you think your special insights are, your particular focuses are, in terms of your interviews and comics work generally? Is there a story or a kind of comic that interests you more than others, is there a story or a comic we could create in a laboratory that would be right up your alley? ARRANT: My experience as a comics writer is infinitesimally small, but I feel it's made a difference -- especially in understanding the production of comic books and the unique demands that has on people working in the industry -- creators, editors, production staff and on down through the line. In terms of my focus, currently a majority of my focus is providing frontline reporting on Marvel's comics output for Newsarama. In some cases that's more of a "meat and potatoes" type affair in terms of lines of questioning, but Mike Doran and Lucas Siegel do allow me some latitude -- time permitting -- to get out of that box and just talk to creators without any specific agenda -- my November interview with J.H. Williams 3 is a good example. There's a lot more I want to do in terms of interviews, articles and features, but time, resources, and outside editorial concerns play huge factors in what ultimately gets done. Over at Robot 6, I'm do a couple posts on Wednesday that are sometimes time-relevant but oftentimes just a de facto Tumblr for me, and on Fridays I do longer-form general interviews with creators I'm interested in talking to that my editors there are also interested in me talking to. But outside that, I've been working these past few years to try to carve out some time in interviews -- even in the requisite articles covering a newly announced book, for example -- to get past the promotional and get into the personal with a creator. Whenever I do a phone interview, or do longer interviews by email, I try to open up with softball, open-ended questions for the people I'm interviewing -- "what are you working on?" has become a common crutch for me recently. In some cases that Q&A portion doesn't make it to the final printed interview, but oftentimes, for me at least, it's the most genuine part of the conversation -- especially in the unfortunate rote formula that 'emails Q&As as high school essay questions' have become. In those cases I sometimes drill down -- apologies to the people I've interviewed like this -- with three or four rounds of follow-up questions; sometimes to get facts not clear in the initial answer, but oftentimes to get into the things behind those facts -- the ambitions, the concerns, and basically the 'what were you thinking?' which lead to those decisions. As far as an ideal comic that would interest me as a journalist covering it? I have a couple answers for that; as a fan, afictionado and one-time wannabe comics artist, I'd love the opportunity to do more art-centric writing about comics -- I've recently been re-reading Steve Rude's work and last night I read World's Finest with Dave Gibbons writing, and those pages are chock full of moments and choices I'd love to critically wrap my head around and write about it. But does a sizeable enough audience read that sort of thing, or a journalism outfit have a base enough, to support the time and energy needed to do that? Unfortunately, no. Another aspect as a person working in journalism and covering this industry is the business side of things. I feel that facet of the comics business is severely overlooked by journalism outlets, but from working on the inside I see why; editors and publishers don't see a readership there to support funding those articles. Articles of this fashion are commissioned on occasion, but the traffic on those is far overshadowed by stories covering comics from an entertainment aspect. By and large comics journalism is more Entertainment Weekly than Wall Street Journal or even Variety. It's just the way it is. SPURGEON: How are you different now as an interviewer than when you started? ARRANT: My first interview for covering comics was with Kurt Busiek, talking about the then-upcoming debut of Superman: Secret Identity. My editor at the time, Matt Brady, held my hand on the etiquette of comics, doing interviews, and the format of email Q&As. I'd interviewed in the past of course, but those were for local papers on an in-person or phone basis, and about local issues as opposed to entertainment journalism. Since that time in 2003, I feel like I've grown a lot -- and have a lot yet to grow -- in terms of asking more than the basic questions. I do ask the basic questions because they're needed, but there's more than one way to get a story and tell a story for me. Another aspect is learning more about the industry from the people who work in it; I frequently reference Fantagraphics' compendium of Frank Miller interviews from a decade or so ago, and I've struck up conversations online and in person with people in various places in the industry. I have a couple of sounding boards of people in the industry, or who have left it, to get my bearings on some areas where I need it, or just need a second opinion. SPURGEON: Are you happy with the options you have to write about comics, or to interview about comics? Do you miss any avenues that are no longer open for you? Do you feel like you'll be able to do this for a while? ARRANT: I touched on this before, but I can say I enjoy what I do now but I'd also enjoy covering comics from different vantage points. I've had conversations with several companies about taking an editorial role of comics sites but I've never had the right opportunity present itself to go down that path. As for missing any avenues no longer open? A younger me might say I was never able to write for the classic Comics Journal or Amazing Heroes, or my guilty pleasure of the old Marvel Age magazine -- next to Fred Hembeck. As a professional? There's not much to miss -- with some few exceptions, comics journalism is in a better place now than it has been before; not to say it's great now, but comparatively we're in a better place. Could I do this for awhile? I could, either continuing to write for others or establishing my own site, but there's other goals I have outside of comics journalism I'd like to pursue as well. ARRANT: Most of my friends in the comics business are artists; the artists working on the books, and also the production and design staff behind the scenes. Why is that? 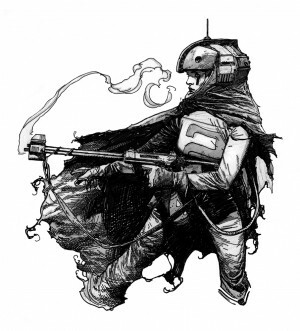 Maybe it's because I took classes in college hoping to be an artist but quit when I got an Icarus complex over Travis Charest's work. 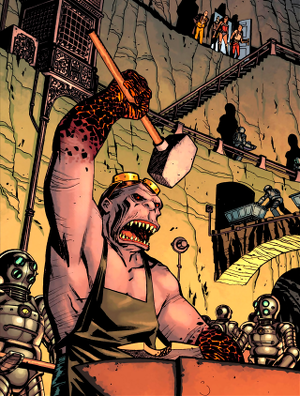 There's a lot more that can be said about art's role in comics; from large scale things such as art providing the tenor to the stories being told, but also smaller things that are often overlooked. Things like crediting an artist when websites and magazines show their art, or including their name when you list the author of a comic book concept. I'm not even talking about Jack Kirby and Steve Ditko in relation to Marvel, but down to a smaller everyday scale of journalists/editors leaving out an artist's name when talking about a creator-owned project in the possessive term. Part of that I admit is due to most comics production schedule forcing it to be so the artist can't draw every issue, but there's still room to include it. I see the large-scale comics outfits becoming a writer's medium for some time now; it started once the bloom came off the rose for superstar artists in the 1990s, and it's become something akin to television where the directors are interchangeable and the writers are the primary "storyteller" of the work. That's as opposed to movies, which are still primary a director's medium and the director by-and-large has that stamp of artistry shown in the final cut. Neither way is ideal, but collaboration is a very hard thing to do in a way that's honorable to all parties involved. Getting back to your point about comics journalism covering comics in narrative form moreso than artistic, it's a major problem. I have the problem myself, but I've taken steps to amend it. I have some college classes and background as a designer, but I've also taken some college art history classes in recent time and bought some books on art criticism to attempt to speak more knowledgeably about art in comics. Work in progress. SPURGEON: So this project. Can you tell me where doing a book on Cliff fits into your overall projects? Why was it appealing for you to do a book right now? ARRANT: I've been a fan of the Modern Masters books for awhile, and larger than that a fan of long-form interview books of creative types going back to high school. Big fan of Studs Turkel as well. I enjoy the nature of conversation, especially in the written form, to being more than just about the facts but about the conversational aspects, the passing mentions, and just the flow of speaking. I'd been wanting to do longer form writing for awhile covering comics in some respects, and some freelance commitments ended and some time opened up for me to do it. Also, my wife was enrolling in grad school, leaving me some extra time to do work since she too would be nose-deep in books and research. SPURGEON: Talk me though as much of the development process as you can. Do they come to you? Do you go to them? What about Cliff -- assignment or proposal -- attracted you in terms of this kind of project? ARRANT: How did I come to do this book? I'd been reading the Modern Masters series for years, even using them as reference in some of my work, and I had a gap in my schedule in 2012 and on a lark emailed TwoMorrows blindly to ask about doing it. They were interested, and we went from there. I'd never done book-length interviews before; the closest I'd come is a five-part interview with J. Michael Straczynski ages ago for Newsarama. It was a challenge, but a challenge I wanted to do. I'd been fortunate enough to interview a wide range of artists and had some idea of who'd be interesting to talk to and could put up with me for that length of time. There was a short list I prepared and submitted to TwoMorrows, and then John Morrow and Eric Nolan-Weathington narrowed it down to two names, and Cliff was one of them. SPURGEON: [laughs] Is it difficult to work with a contextual project with these aims given that Cliff is still early on in what one hopes is a long career? How do you make sense of a career that's so near its beginning and could go anywhere from here? ARRANT: The title of this book series, "Modern Masters," does give out a vibe of only being for those who have done 30-40 years in the business, but some of my favorite in the series have been with those who were still in the early stages of their career -- Eric Powell's, Chris Sprouse's, and Mike Wieringo's for example. But that being said, Cliff's lead an interesting life as a comics professional; I delved deeper into his career before I asked him to make sure there'd be enough fertile ground to sow, and there was. His upbringing, his Harvard education, working as an intern for Marvel and editor for Disney and DC, then apprenticing under Walt Simonson and then onto his official start of his career in 1999. Cliff's put 15 years into the industry full of ups and downs, and he's one of the most level-headed guys I know in comics. But yeah, he still as 30-40 years in comics if he wanted it; but I felt, and feel, that this time now is a pivotal moment for his career and I wanted to document that. What if someone had done a book-length interview with Frank Miller in 1983? Jack Kirby in 1960? Jim Lee in 1991? Or more recent, Robert Kirkman in 2007, Stuart Immonen in 2002? They had big futures ahead of them, but they had already done a sizeable amount and clearly had a lot on their mind. SPURGEON: Are there model works or even books in this series that you look to? Is there someone who you think does this specific kind of work very well? Anything you pulled from? ARRANT: Old copies of The Comics Journal and Amazing Heroes, Studs Turkel's Working, old interviews by the late Daniel Robert Epstein, and from Modern Masters I'd say the Wieringo book and the Bruce Timm. That and Terry Gross on Fresh Air every week. SPURGEON: I'd like to draw you out as much as possible in terms of specifics on the practcalities of doing a book like this. I know you're prone to pretty extensive research. What was your research like here? Was it reading, talking to other people? Did you pre-interview? ARRANT: The first step was reading as much written about Cliff as I could find; mostly that's online interviews, both accessible and those gained through the Wayback Machine. I also dug into Harvard's university newspaper and found some bits on him, before comics. The second step was reading and re-reading Cliff's comics work. I thought I had a lot in my files (read: boxes and boxes of comics in storage), but there was a lot I was missing. A friend at DC helped me there, but I also spent a sizeable chunk of money ordering single issues through online retailers. In the beginning I planned on doing some background interviews with people who had worked with Cliff, but once I sat down and saw how much research I'd done I relented from that. I did have several conversations with Cliff by phone and email before we began the formal interviews however, to get a feel for things and to get info from the source. SPURGEON: The interview that constitutes most of this book... how was that done? I know you're in Florida, so was this done in person or long distance? Spoken or written? Did you fashion answers afterward -- what was the editing process like? Was there another voice involved at that point? ARRANT: Yes, unfortunately the budgets for this kind of book doesn't allow for conducting this in person. The first draft of the entire book was done from recorded phone interviews, with Cliff being very patient as I had some technical glitches that necessitated some repetition in interviews. But we did the interviews by phone in two hour chunks in the morning before he began work for the day, then they were transcribed. We looked over the transcription and I found several instances of "why didn't I ask this when he said that?!" and Cliff agreed to go back with me and dig deeper. Eric Nolen-Weathington was my editor on this, and is a very kind and patient man. He offered some tips on the logistics of such an epic recording, and was a sounding board for me in terms of staying on point -- and knowing when to go off track -- in the interviews. The final drafts were Cliff, Eric and I looking over a PDF of the book tweaking wording, punctuation, grammar, as well as the layout of the book. SPURGEON: Who chose the art and assembled the art? How much input did you have on what was included and how that was presented? Did you work the publishers directly on that, or was that a matter of fair use for you just in terms of seeking out a partnership with them? ARRANT: We were fortunate enough that Cliff keeps an immaculate file of most all of the work he's done. What he didn't have was at his mother's house, so we had a lot to choose from. Cliff deposited it in Dropbox and Eric and I began poring over it like Chuck Rozanski when he discovered the Edgar Church collection. As far as my input, there were specific pieces mentioned in the interviews that I made a list of to include, but the rest was worked out between Cliff and Eric. I was told the cover was ran by DC, but I'm not sure what arrangements TwoMorrows made with DC and Cliff's other publishers. SPURGEON: Cliff comes across as smart and articulate. The latter isn't true of all smart and talented people and the former isn't true of all people, period. Is it helpful to deal with someone that can speak on their feet, that can answers questions directly, as put to them? Have you ever worked with someone that was less articulate? What did you do then? ARRANT: Cliff was an ideal interview subject and partner in this undertaking. I've probably interviewed 1500 people in my career thusfar, and one of the reasons Cliff was on my shortlist was I admired his work and I knew he would be an informative and interesting interview. But I've interviewed people who were short, smug and reticent to talk? That can be off-putting, especially when you're interviewing someone looking for facts -- I interviewed a major comics writer a few years back who I was a fan of, and found out why he rarely does interviews -- he doesn't like doing them and makes it known, but also makes it so people don't want to interview him again. But in some of those cases other where you have rambling interviewees who don't answer your question but answer their own, it can be a different kind of enjoyment. You just have to adjust your expectations and deal with what you're given than what you're asking. SPURGEON: The structure of the interview is a very standard, class "career-spanning" progression. Did you ever think about another way of doing it? That might be part of the series, I'm not sure. Does doing an interview that way lock you into certain discussion, do you think, like talking about building a skill set, or departures from one project to the next? ARRANT: In the early planning stages of this I plotted out some alternate scenarios for how to approach the subject matter, but all of the previous Modern Masters books did it in a firm linear narrative so I stuck to that. SPURGEON: What do you think people react to in Cliff's work? Was there anything you felt you were seeing that maybe others, or more casual fans, haven't noticed to the extent you have? ARRANT: Cliff has a great economy of line, but also an overriding sense of style that blends with that first notion. Some people have one or another, but it's hard to find an ideal blending. As a fan I'd come to appreciate Cliff's work on several levels; first as someone practicing what I saw was an Alex Toth-like approach, but then later for his superior design sense, especially in Cliff's covers. Around the time of Greendale, I revisited his past work looking at in a storytelling approach -- not just drawing pieces of artwork on a page but building a larger story. His work on Wonder Woman has exposed him to audiences who'd never before seen his work, or seen it on that kind of stage, but for me I feel he's been a critical favorite going back to Beware The Creeper. It just takes time for that to translate, if at all for some artists. As for any nuanced perspective on his art that others might not see? I've been re-reading his Wonder Woman since the Modern Masters book came out, and I've found a new appreciation for the choices he's made in panel composition and for staging. There are times were there's other options he could have pursued, some maybe to create a bolder panel, but I can see him making smarter choices in service to the story as a whole rather than individual panels or even the allure of more marketable original art pages. 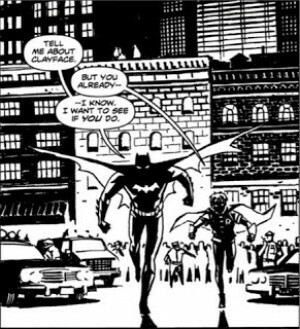 There's some recent work by him that's overlooked that I'd encourage people to check out: the story he did with Brett Lewis in the Vertigo anthology The Witching Hour was some amazing storytelling done in short order, and then also the story he wrote and drew for Batman Black and White #6. SPURGEON: What is your sense of Cliff's career? Do you think he's been used well, do you think the industry has done well by him? Is there anything you would specifically wish for him moving forward? ARRANT: That's a hard thing for me to say. In our interviews for Modern Masters I get a little disappointed to learn about these other tantalizing projects that were in the works at DC that he never did such as a PIXAR-esque Aquaman graphic novel or a pulp Batman series, but looking at it more rationalizing it's hard to say if those speculative projects -- where my imagination fills in the blanks -- would match up to the projects he actually did. 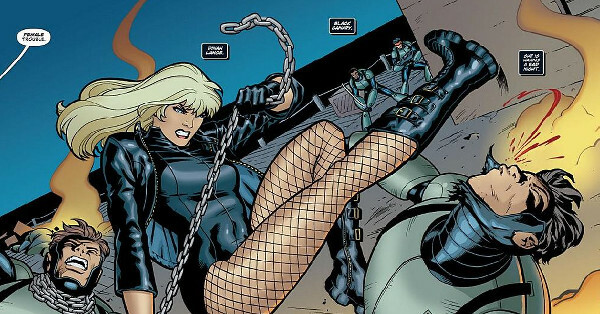 As far as being used well by DC, there are numerous other characters and situations he could excel at if that's what they wanted, and more importantly, what he wanted. I think it's interesting he's only done one piece of work for Marvel, a pin-up early in his career. Part of me would like to see him go there with those characters and the editorial/marketing regime Marvel has, but speaking larger I'd love to see him create new stories from the ground up. 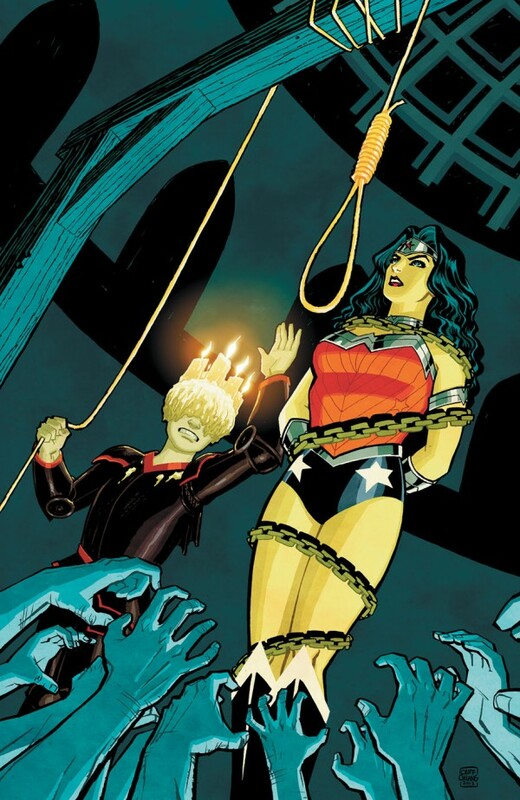 That story in Witching Hour was eye-opening, especially in relation to his concurrent work on Wonder Woman. If Cliff has the story, or partnering with a writer and they have one together, I'd love to see them experiment with creator-owned work. ARRANT: Censoring? I wouldn't go that far, but I edit sometimes what I ask just in terms of where I think the most interesting conversations will be found for the reader. For Modern Masters I'm doing work for someone else, and looking to perform to what was agreed upon with them. I wouldn't have agreed to those terms if I thought I didn't have the room, the support and the latitude to do something important and justifying for the time and energy everyone involved spent on it. Going to your specific point about the use of photo reference and character reference in comics, it's a subject I've thought about even before I was a working journalist but just a young fan reading New Mutants #100 and seeing pieces of Frank Miller's Ronin and George Perez's Teen Titans. My thoughts on the issue have matured over time to understand the valid points of using it to some degree, both in comics from unapproved likenesses being used for characters to acknowledged homages and down to swipes and wholesale repurposing of art. That is a conversation worth having in the comics community, but it's about finding the right stage to discuss that in a way that's meaningful. I could have spent an entire chapter of the Modern Masters book, for instance, delving deeper into that side of things spurring from the appropriation of famous figures' likenesses in Human Target and Wonder Woman, but more ink spent on that would mean less spent on other aspects of his life. I feel that the Modern Masters books are biographies-as-interviews, and that's what people want to read out of that. 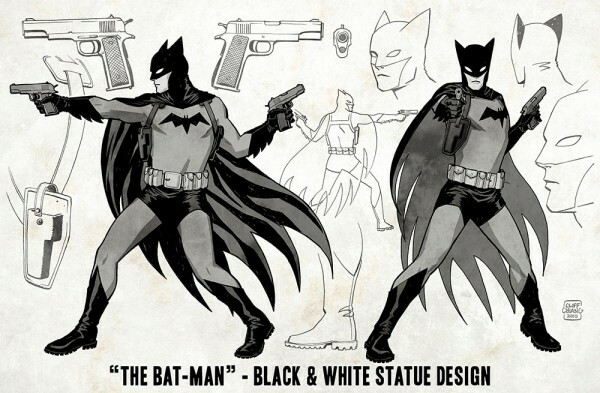 I'd love to do an article, or article series, about the appropriation of art in comics. From outsiders like Lichenstein to so called "tracers," homagers, and even artists using cityscape photos as background in the 1970s and 1980s without giving credit. It's interesting that some of the major companies in their work-for-hire contracts have a page or two talking about art appropriation, even boiling it down to the percentage it can be like the original without raising flags. If any comics journalism editors are reading this and want to talk about it, email me! SPURGEON: What would you have people take away about Cliff, if they could take away one or two things? ARRANT: Essentially it would be about the kind of life Cliff has had, how he carries himself as a person and a professional, and how that factors into these comics he draws. And that he's an artist doing comics as opposed to "just" a comics artist. SPURGEON: I wanted to toss this in. You mentioned you did the Princess Diana comic for Bluewater. You also have experience with I'd bet about a half-dozen other publishers. What was the Bluewater experience like for a creator? Did you contract with just a letter, like I've heard? Were you left alone to write? ARRANT: My experience with Bluewater was illuminating. I was aware of their track record on the shelves and behind the scenes, and spoke with several people who did business with them in the past before committing to work for them. I came into it wanting a learning experience, and I viewed the comics biography books as a kind of journalism told in comics form. 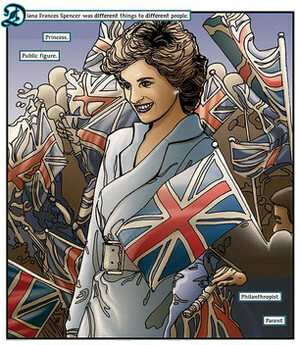 For the Female Force: Princess Diana book I worked with company owner Darren Davis and artist Andrew Yerrakadu, and I didn't have any outside expectations of what it was. It proved to be a valuable learning experience, as a journalist covering comics, but also as someone working in the publishing industry. As far as my contract, it was straight-forward and outlined what I was giving to them and what I was getting out of it. I've had longer contracts, and I've had shorter contracts. Darren lived up to the terms of the agreement, and that one-shot book has been collected, reprinted, and even sold digitally on several platforms. SPURGEON: Is there a Northwest Florida comics scene? ARRANT: Nothing in comparison to major urban cities, but there are a number of people starting out as comics professionals in the Northwest Florida area who are self-publishing in print and online. As far as comics stores, I feel the area is lucky to be pretty well covered in terms of comics stores; there are four full-serve shops within a 10 mile radius of myself, and if you spread that out to the 100 mile mark there's three more. TOM SPURGEON: Cliff, I was wondering if you could talk about how you were approached and what made you say yes. What was appealing for you to be part of a project like this one? What made you say yes? 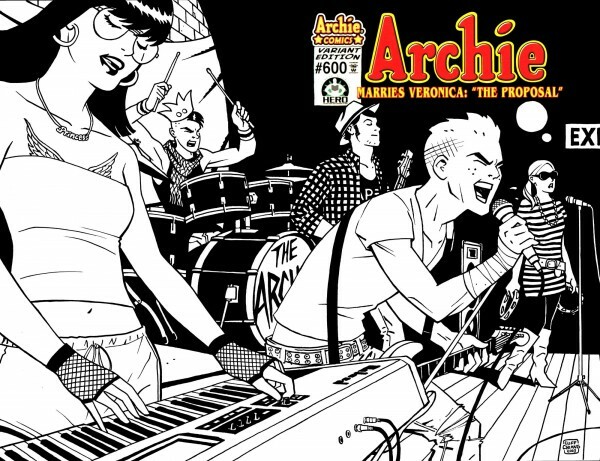 CLIFF CHIANG: I'm a big fan of the Modern Masters series, and I love to hear other creators talk about their history, working up through the ranks, stuff like that. You get a glimpse of the artist's personality and thought process that you can't necessarily intuit through their artwork alone. Everyone has a different story about how they broke in, or how they approach their day, and I'm a junkie for that sort of thing. When I was starting out, I'd hunt down printed interviews with creators I admired. Finding issues of TCJ with [David] Mazzuchelli or Los Bros [Hernandez]? Those were a goldmine to me. Now everything's scattered on the internet. This seemed like a good opportunity to tell the roundabout story of how I became an artist, get it in print and hopefully be a resource for aspiring cartoonists. But it did take me a few days to respond to Chris Arrant's initial email. I hold the other artists in the series in very high regard, and don't really count myself among them. I guess the actual title of the book was the biggest stumbling block for me. But for those who enjoy my work, I thought it would be a worthwhile thing to do. SPURGEON: For that matter, I always wonder how guys in your position might decide how to work with such projects -- even major web site interviews -- more generally. We have a really diffuse media set-up now, with a lot of players. Do you mind this part of your job, the part where you reach out to people through attentive media? CHIANG: DC handles the press for Wonder Woman, so I haven't had to reach out very much over the last three years. I probably did too many interviews when the New 52 started, just hyping the book and answering the same slate of questions. I started to hate myself. I prefer a more substantive conversation, so I've hung back a bit lately. I was nervous about doing the book, but Chris and I have done interviews together in the past and I've enjoyed his pieces, so it was the best possible situation. I'm really proud of how it turned out, and lucky to work with Chris and Eric Nolen-Weathington on it. SPURGEON: This book captures you at a very strong point in your career, I think. Do you feel like a finished product? Do you feel like you're in a creative space from where you'll work for a while? Was there any hesitation on your part to not take part in such a project until you were a bit further along in your career? CHIANG: I'd like to think I'm a work-in-progress, but thanks to Wonder Woman my art is more visible than ever and I thought it'd be interesting to take a snapshot now. But it's funny because I'm finally at a point where I'm more confident about my work, but I'm also feeling the urge to shake things up. With any luck I'll continue to grow and be do things differently even a year from now. SPURGEON: Do you think about career at all? Comics can be a strange and maddening place in terms of always getting work that flatters one's talent. You seem pretty comfortable in the book with how you've gotten to the place you're currently situated; is that a fair assessment? CHIANG: To be honest, I'm probably too comfortable. I'm very grateful to DC and Vertigo for nurturing me and it's been great working with them, but in the book you'll find one of my career obsessions is to avoid being typecast or pigeon-holed. Right now, I don't know what's coming after Wonder Woman, but I'll have to take some bigger risks soon. That's partly to keep me creatively energized, but also to hopefully broaden the scope of my career. SPURGEON: I'm very fond of your design work. The thing that jumps out at me on Wonder Woman is the varying provenances of the major designs. 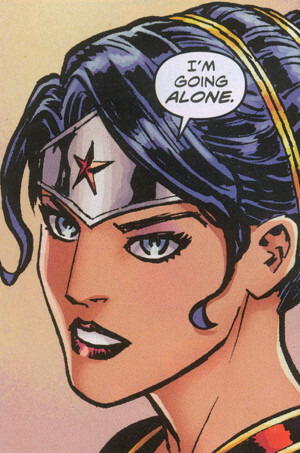 Your Wonder Woman is a tweak of I believe a Jim Lee design. 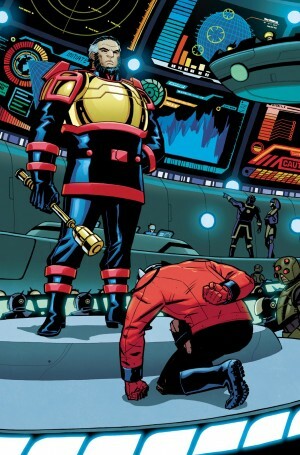 Your New Gods designs are based on the great Kirby conceptions. There are original designs as well. How much attention do you pay on these costumes working as an ensemble? And can you talk about the Orion tweak in particular, the choices you made there given what a enormously strong basic design that is? CHIANG: I wish I had the forethought to think of them as an ensemble. All the designs were done on a case-by-case basis, and the only thing holding them together is an underlying sensibility of trying to keep it graphic and readable. For the Greek gods, make them modern, or weird... no togas. With Orion, we saw no need to change the look but we were asked to embrace the idea and mission of the New 52 more fully, and that meant coming up with something, well, new. Early on, Jim Lee did some Orion sketches to get us thinking differently, and it really helped get me over the hump. Mentally, I had to get past the idea of making it better; Kirby's design can't be improved upon! What I could accept was running the design through my own aesthetic filters. It's not better, but it's me. I do think we ended up with a stronger character for our book as a result, because [writer Brian] Azzarello and I had to focus on how we wanted to portray Orion. It wasn't an easy process, but I'm really glad DC pushed us. And hey, now there's an action figure of it, too. SPURGEON: What was it like for you to come out on the other side of this, Cliff? Did you gain any perspective you maybe hadn't before this project, on where you are and where you're going? CHIANG: It was really humbling for me to reflect on 15 years of work, particularly the early years. Now, I had my ambitions and I hustled, but goddamn was I lucky, too. I owe a lot of people for giving me a chance and there's nothing like seeing it in black and white. I have to make good on the opportunities I was granted and make sure this book isn't the whole story. If anything, it's increased the pressure to do more and do better in the future. 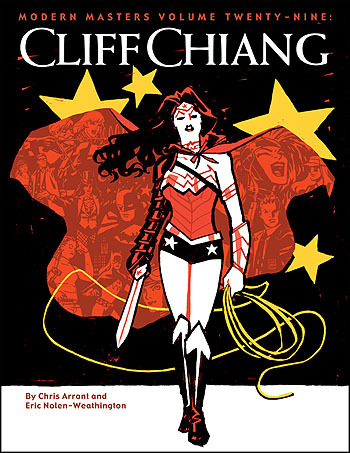 * Modern Masters Volume 29: Cliff Chiang, Chris Arrant And Eric Nolan-Weathington, TwoMorrows, softcover, 120 pages, 9781605490502, 1605490504, $15.95.